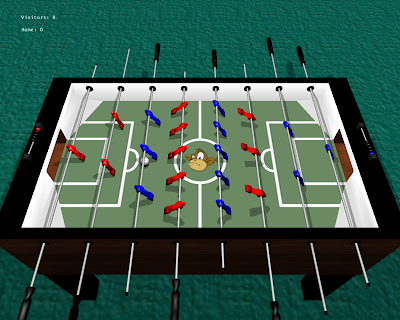 Random Thoughts: Fooseball et. al. I am not really a pro at Fooseball but thought I would better write one on this, having been so involved with this game now and liking it like ever. I find it more of a mental game, requiring to build pressure on the opponent through action and strategy (anyone seen the '100 girls'). And ofcourse physical skills are the key. Requiring heavy wrist-work, good hand-eye coordination, and a cool temperament, it is really fascinating playing this game. I didn't knew long before that there were more than one versions of the game. I thought the 2-player a side was the only one. But then I discovered that there is even an 11-a side version. I find it hard to score in 2-a-side, 11-a-side is simply, wow!!! In fact a friend of mine even said, are they really able to score in this 11-a-side one??? Keep going guys, have a good time at Fooseball !!! perfect. a perfect description from someone who loves the game. but then there is another point i thought i would put in here. the game remains a game so long as u play for what u play as sara as written about. but when u try to become skilled n play as a professional league, it loses the charm that is associated in playing n it starts getting heavy.